The cold weather could use a little spice. This flavorful Lemon and Pepper Chicken with Sweet Chili is perfect for a comforting dinner at home with the whole family. Beats braving the rain to visit a restaurant! 1. Rub the chicken with the lemon-pepper seasoning, then stuff its inside with lemongrass, corn kernel and grapes. Season it with salt and pepper. 2. 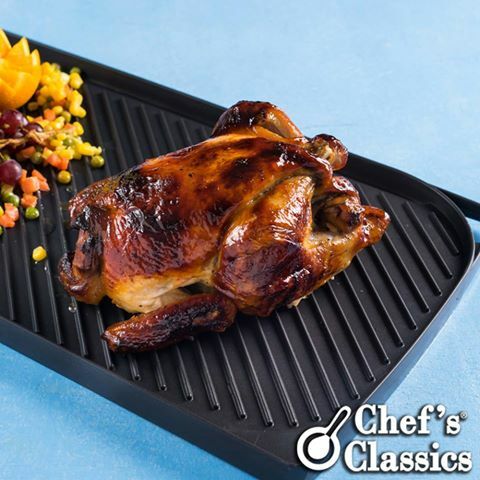 Use the Chef s Classics Detachable Caper Series Grill Pan. Heat the pan with olive oil and grill the chicken for about 5 to 10 minutes. Brush the chicken with sweet chili sauce. 3. Transfer the detachable pan griller to the oven and bake the chicken for about 30 to 45 minutes. Voila! Enjoy your meal!